A few people have been asking. The TCS Kids' Cafe is taking a break this year. At this point we are not sure when we'll start another project. 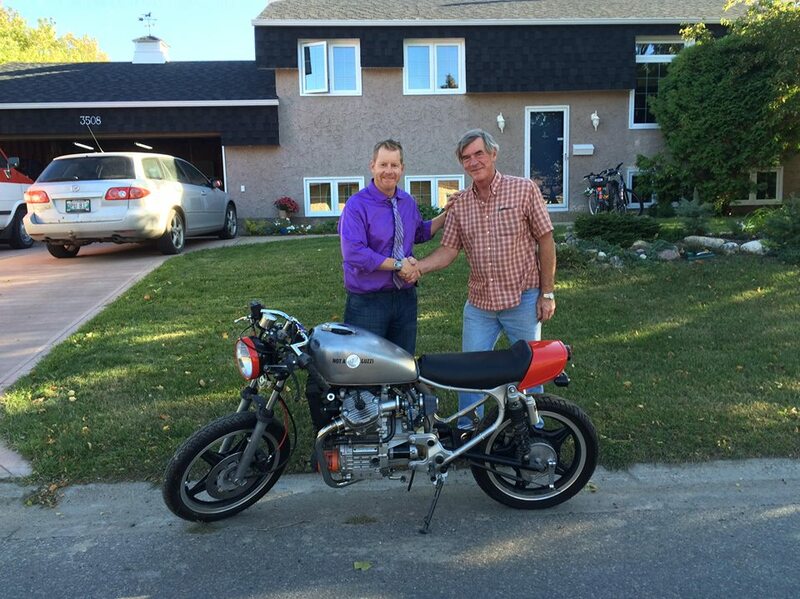 Jim Beattie made the trek out to Brandon to take ownership of the CX500 Cafe Racer. 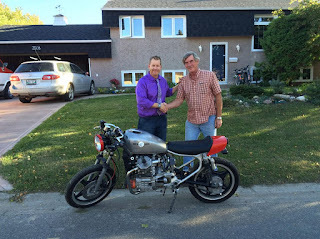 Jim was thrilled with the bike, and as a long-time Honda owner and vintage bike enthusiast, he will give it a good home. Thanks again to all who supported the project over the past two years! Jim Beattie from Lockport, MB is the lucky winner of the CX500 and the Nexx Helmet. In the next few weeks we'll turn the bike over to it's new owner and show some pictures. We made the draw today... just waiting on confirming contact with the winner... Will update the web page as soon as we hear. Everyone gets a ride! If you are interested in purchasing tickets, you can do the following. Tickets are $10 each and only 500 will be sold. PLEASE include your phone number in your ticket request -- that's the best way to contact the winner! Cheques should be made out to "TCS Kids' Cafe". You can also call Mr. S at 204-726-5025 to explore other ticket payment options! We treated the bike to a brand new, Ballistic Lithium-Ion battery. These will be the wave of the future, and maybe power motorcycles (widespread) in the future. For now, they provide amazing power with little weight in a tiny package. It fits nicely under the rear seat hump. Out of the way, and protected from the elements. It has plenty of "juice" to turn over the big pistons on our twin. The tank cap was installed, and test-fitted into place. Thankfully we had no fuel to run through it, as we forgot to install the petcock on the left hand side!!! That would have meant a nasty spill on the floor. It`s nearly complete -- still some details to sort, but we should have those complete by the next session! Mr. S has gone to grab another lottery licence, and the raffle should start shortly. More details to follow. Another successful Kids Cafe session saw us do some work on the "lifeblood" of any machine, the fluids. Step one was the bleed the front brake system. The rear is a mechanical drum brake, so the front needed some new DOT4 fluid. The finishing touch was to reinstall the resevoir cover. Now the CXCafe has a more powerful front master cylinder, uprated front caliper from a CB900, and a new lightweight EBC front brake rotor, along with the red stainless brake line and new fittings from Venhill. The front caliper itself was also rebuilt with new seals as well. As good (better!) than new. Next the rear driveshaft got new gearbox oil. Transcanada Motorsports hooked us up with some new fluid. Oil and lubrication technology has come a long way since 1979. We used a plastic syringe to add the 5.7 oz as specified in the manual. And we only spilled a little bit. We also broke out the grease gun to lubricate the gears -- easy peasy with the zerk fitting easily accessed on the swingarm. As you can tell, "red" is the color of choice. The headlight bezel was painted and clearcoated, and reinstalled, hiding the wiring from view. Finally the seat hump was fitted as well. We need to install the new lithium-ion battery under the hump (we've dug up an old KTM dirtbike battery box to hold it in place). The seat slides into place nicely. What's left are a few more details before we can fit the tank and start it up again! XS650 Direct: a Canadian source for parts! We are a group of students who will be learning about motorcycle mechanics and constructing something cool with our hands!